ntsocialism. : Stitches go off today. The surgery stitches and staples go off today at Penang General Hospital. I will also have my seroma aspirated and have a little one-on-one conversation with the neurosurgery or oncology department there. I hope to be able to compose a blog update later this evening. There needs to be some form of plan for post-operative treatment which will take place in 4-6 weeks' time. Well, today did NOT go as planned. 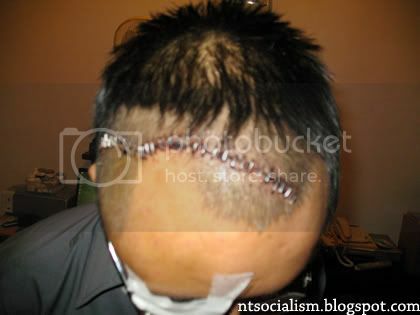 Penang GH only agreed to remove the stitches partially and didn't have the chutzpah to get my seroma aspirated. They have suggested that I get it done through HUKM this Thursday next week and in all honesty that's my best guess where my next blog entry will come from. Sorry lads!